Happy Earth Day, everyone. I’ve done a number of posts over the years about recycling, ebooks, and other environmental topics, but today, I wanted to provide you with more of a hodgepodge of information. Last November you took part in our Green Books Campaign and we thought you might be interested to learn on the campaign we’re launching for the upcoming Earth Day. This year we are celebrating the 41th Earth Day with a special campaign – 41 Reasons to Plant a Tree for Your Book. With more than 180,000 trees planted so far on behalf of readers, authors and publishers working with Eco-Libris, it’s no surprise we think planting trees to green up books is a great idea.. But we also want to hear what readers think about it and why they believe planting trees for their books is a good idea, and so for 41 days, beginning on March 13 and continuing through April 22 (Earth Day) we’ll publish on our blog 41 of the best replies we’ll get, one reply every day! We have great prizes to all the readers whose replies we’ll publish, including a $25 gift card for Strand Bookstore, audiobooks from Simon & Schuster Audio (such as The Half Life by Jennifer Weiner, American Assassin by Vince Flynn and Essence of Happiness by the Dalai Lama) and great green books, like Planet Home by Jeffrey Hollender, Little Green Books, Spit That Out! by Paige Wolf, The Story of Stuff by Annie Leonard and many more! You can see the full list of the prizes on the campaign’s page. Today, I’m striving to reduce energy use in my new home by installing eco-friendly light bulbs, ensuring that I recycle as much plastic and paper as I can, and reducing water consumption through my dishwashers “water miser” setting. I’ve also heard some great things about rain barrels, and hope to comparison shop for one which we can use in our backyard. Since giving birth to my daughter, I’ve reduce my energy consumption by working from home, but naturally, that’s a perk that will end sooner than I’d like. What plans do you have to reduce your carbon footprint (take the quiz to see what your footprint is) or to conserve? If you are interested in signing a petition to foster a “greener” economy here in the United States, please sign it here. You also can go to the Earth Day Network and find events happening in your local area. Please check out those events for the Washington, D.C., region. But even if you don’t have the time or there are no Earth Day events near you, take the time to spend a moment or two outside cleaning up your own yard or your local neighborhood, which can be as easy as picking up stray litter or dog poop. You can even take time to visit a local park and clean up there or simply sit and enjoy the pleasures of nature. Enjoy Earth Day and spread the word! Happy Earth Day, everyone! I try my best to celebrate Earth Day and its 40th anniversary. What better way to take action in our homes to save the environment and become healthier than by heeding the advice in Aviva Goldfarb‘s SOS! The Six O’Clock Scramble to the Rescue. Before we get the actual cookbook, I wanted to let you know that each copy purchased includes a one-month subscription to the Scramble and a portion of the proceeds will be donated to the Environmental Working Group, which works to use public information’s power to help consumers improve their health and save the environment by offering resources to make better decisions and to affect policy change. and reducing the heavy use of meat in our diets. Once the staples are purchased and available to you, you should check out the break down of fruits and vegetables by season so that you shop for those items when they are in season. Shopping for veggies and fruits in season reduces your carbon footprint, according to Goldfarb, because it reduces the need to truck those foods across the country or from another nation where they are in season. The rest of the cookbook is broken down by season and includes a weekly plan of menus for families to try out and advice for keeping the menu plan on schedule, using canvas bags or reusing plastic and paper bags, creating healthy and tasty lunches for school, picking healthy snacks, and more. However, the book does not include photos of the recipes, which novice cooks might want to check out to see how well they are doing with their own attempts at the recipes. For busy, book blogger and other moms, SOS! The Six O’Clock Scramble to the Rescue is an excellent edition to your cookbooks. Goldfarb’s book is more than a cookbook, it is full of advice on how to make healthy choices for families, how to reduce carbon footprints, shop locally, and more. Aviva Goldfarb (Photo credit: Rachael Spiegel) is author and founder of The Six O’Clock Scramble®, a seasonal online weekly menu planner and cookbook (St. Martin’s Press, 2006) who lives in Chevy Chase, Md. She has just released a new cookbook, SOS! The Six O’Clock Scramble to the Rescue: Earth-Friendly, Kid-Pleasing Dinners for Busy Families. Aviva is regularly quoted in popular online and print Family and Health publications. She is an advocate for healthy families, actively working with national nonprofit organizations and with parents to improve nutrition. Thanks to Diane Saarinen and St. Martin’s Press for sending me a free copy of SOS! The Six O’Clock Scramble to the Rescue by Aviva Goldfarb for review. 1. Leave a comment about what you are doing to celebrate Earth Day. 2. Leave a second comment with a tip about how you live greenly. 3. Blog, Tweet, Facebook, Stumble, spread the word about the giveaway and leave me a link. 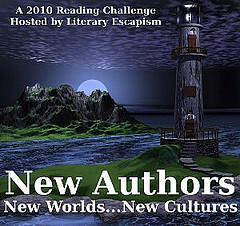 This is my 29th book for the 2010 New Authors Challenge. I hope you enjoyed this latest Literary Road Trip with Chevy Chase, Md., author Aviva Goldfarb. 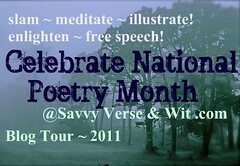 Also check out today’s stop on the National Poetry Month Blog Tour at Necromancy Never Pays! Let’s Celebrate Earth Day Every Day! 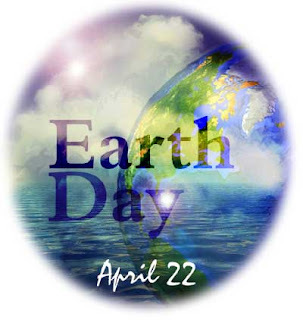 Today, April 22, 2009, is Earth Day! I’d like to urge everyone to celebrate Earth Day every day! I try my best to celebrate the Earth by recycling, reusing, and buying recycled products. Here’s some simple tips for you to try at home, if you don’t already. 2. Use dish towels rather than paper towels to clean up messes and dry dishes; Just don’t use the same one for both tasks. 4. Same goes for your water, soda, and whatever drinks you need on the go; use a reusable bottle, like these from Sigg. 5. Another great tip I saw on Oprah today was to use reusable lunch ware, which you can find here. If you go to Oprah.com, you can a limited time 20% off coupon. 6. If you get plastic bags from the grocery store, you can reuse them to pick up after your pets, rather than buy those individual baggie products to pick up animal waste. 7. If you get paper bags from the grocery store, you can reuse those to cover your kids books, and they can decorate them however they choose. 8. Really, you should use a reusable canvas bag, and I know you book bloggers have them for all those books. Reappropriate one for your groceries. 9. There should be no excuse for not using energy efficient light bulbs, which are widely available and some stores sell them in packages of 4 and 6. 10. Make sure to turn off the water while you brush your teeth and turn off lights in rooms that you are not in or using. 11. My biggest tip is to walk where you can and take public transportation whenever possible. What tips can you offer? I challenge you to post your living green tips and leave a link here.